Brand New, Old Stock, Free Shipping. The Burner with Safety Tray burns Bio-Ethanol fuel, a readily available fuel made from easily renewable resources that emits nothing harmful into the atmosphere. 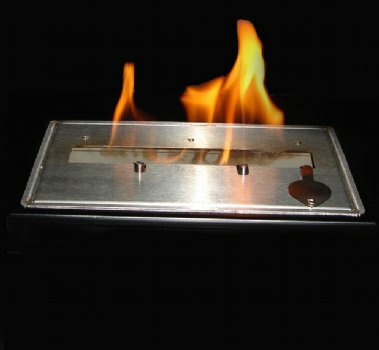 Choose one of our innovative designs, or build the burner into your custom installation! You can now have a real fire with no flue, no pipes, no mess! 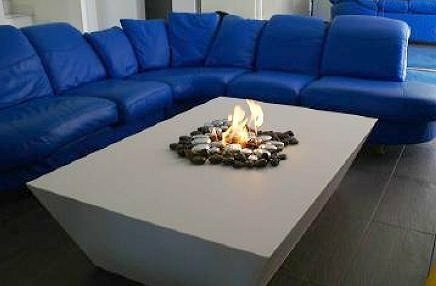 These stylish and ventless fireplaces can be placed anywhere and burn clean, "green" bio fuel made from corn or sugar cane. The sky's the Limit! There are no end of possibilities with this innovative product. You can have fire virtually anywhere your imagination can take you (keeping with-in product safety measures). ** Please Note Photo of a custom Coffee Table, and a custom tile placement of the Burner. 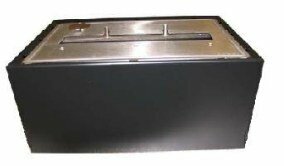 Burners are large, 5 liter capacity! Most others found are only 2 to 2.5 liters in size.